Mix all ingredients together, except coconut oil. Form into meatballs. Heat skillet and add coconut oil. Brown meatballs in coconut oil on medium-high heat. 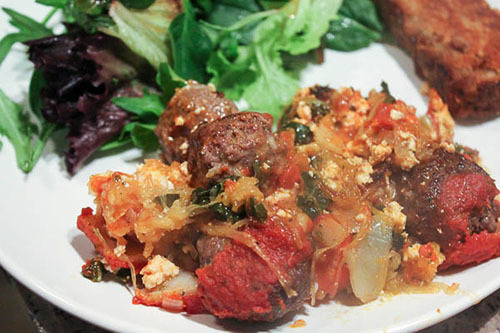 Place browned meatballs in baking dish. Bake at 425° F for about 15 minutes, or until done. Enjoy plain or serve with your favorite red sauce. Recipe by Lynelle. Image by Orissa. Submit your recipes and photos here for a chance to win $50! In a large bowl, combine ground turkey, almond flour, coconut flour and egg. Mix until well blended and form into 1″ meatballs. Place meatballs on a lightly oiled baking sheet. Bake at 375° F for about 20 minutes or until cooked through. Meanwhile, heat coconut oil in a large skillet. Add garlic and onions and sauté until soft. Add in coconut milk, curry, salt and pepper. Cook over low-medium heat for about 10 minutes. Add meatballs to curry sauce and top with cilantro. In a large bowl, combine ground beef, fennel, coriander, basil and oregano. 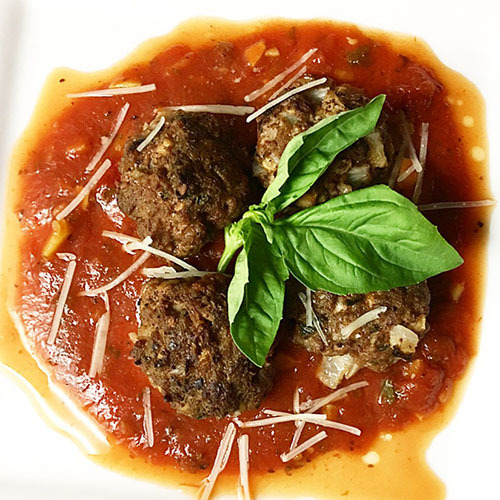 Mix and form into 1-2″ meat balls. 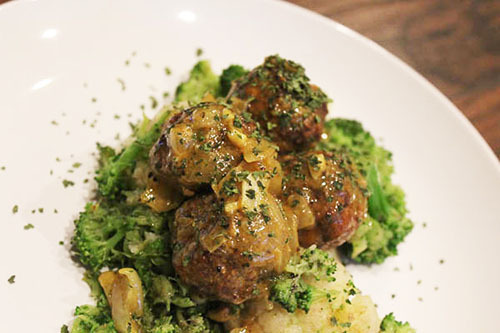 Place meatballs in a large skillet with about 1 tablespoon coconut oil. Cook on each side for about 8-10 minutes or until cooked through. Place spaghetti squash strands in a greased 9×9 baking dish. Mix in collard greens, spinach, ricotta cheese, onions and garlic. Top mixture with meatballs. Top meatballs with tomato slices and shredded cheese. Pour over pasta sauce. Bake at 350° F for about 30 minutes. Mix all meatball ingredients together in a large bowl with your hands. Form into golfball sized balls. Heat 3 medium pans on medium heat with 1 tablespoons cconut oil and 1 tablespoon palm shortening in each pan. Place 4-6 meatballs in each pan and fry till golden brown, flipping once. Finish cooking meatballs in batches until all are done. Place meatballs in crock or pot once finished cooking. In a small saucepan combine all sauce ingredients and cook down until it forms a thickened sauce, about 10-15 minutes. Pour over meatballs. Add extra chopped pineapple or chopped green onions, if desired. Cook meatballs in sauce on low for 1 hour. In a mixing bowl, combine ingredients for meatballs. 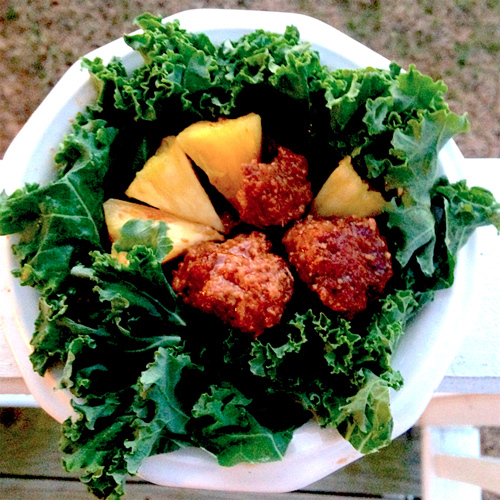 Form into 1″ balls and place in a skillet with 1 tablespoon coconut oil. Cook meatballs over medium heat for about 15 minutes, turning halfway through, or until cooked completely through. Remove meatballs from skillet. Add ghee or butter and onion into skillet and cook for about 5 minutes. Add in salt, pepper, nutmeg and flour. Stir until mixture has thickened. Slowly add in broth and vinegar. Stir constantly until mixture starts to thicken. Add in coconut milk and parsley. Return meatballs to sauce. While meatballs are cooking, add turnips to a medium saucepan and cover with water. Cover and bring to a boil and cook for about 10 minutes or until soft. Drain water from turnips. Add ghee, garlic, salt and coconut milk to turnips. Mash or blend together using a mixer. 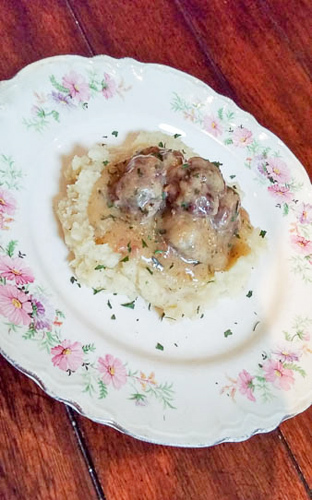 Serve meatballs and sauce over mashed potatoes. Sprinkle with parsley.